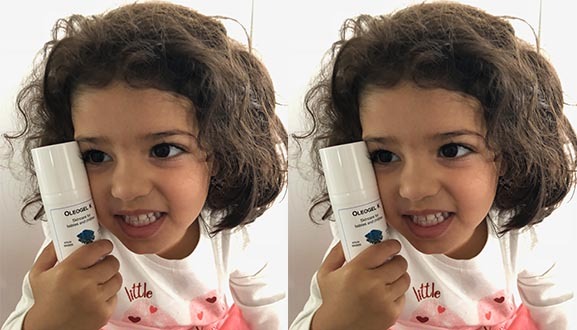 Skin treatment therapist and owner of Samsara Medispa, Priya, knew exactly what to reach for when she noticed her daughter had developed a dry, itchy rash around her mouth – our new Oleogel K! Oleogel K calms and soothes irritated skin of children and babies, whilst repairing and protecting. This formulation was created with the sensitive skin of babies and children in mind, using lipids and our natural phosphatidylcholine. Phosphatidylcholine contains fatty acids that stabilise the skin barrier and preserves the skin’s natural condition. It also helps the product to penetrate quickly, which is a huge bonus when you’re applying this to wriggly little bambinos! Essential fatty acids such as omega-3 & omega-6 and bisabolol (one of the active agents in chamomile) support the treatment and prevention of inflammatory skin reactions and disorders such as redness, rashes, eczema and dermatitis. A low dosage of urea in our Oleogel K inhibits itching, without irritation. Oleogel K also contains Vitamin E, providing further anti-inflammatory properties, anti-redness properties, anti-oxidants and hydration. At dermaviduals, we believe it is never too early to teach the next generation about taking care of their skin! We love your work, Priya! Want to get your hands on our Oleogel K for the little ones in your life? Find your closest dermaviduals stockist here.